CLH Developmental Support Services was chartered in 1960 and incorporated as a charitable non-profit organization in 1966. We are governed by a 9 member volunteer Board of Directors and has a mandate to provide programs and support to the children, youth and adults with developmental support needs (formerly developmental disabilities) and their families. CLH receives funding from the Ministry of Children, Community and Social Services, the Ministry of Municipal Affairs and Housing and the County of Simcoe. To support our range of programs and services, the agency employs over 300 employees and as such, are a significant employer in the community. Fundraising is utilized to support CLH, including fully funding the Summer Teen Camp, recreational activities, as well as specialized transportation. In the final analysis, CLH Developmental Support Services contributes substantially to the local economy. As the people we support age, their support needs continue to become more medically complex with no increased funding. This population is growing rapidly and represent approximately 40% of those receiving residential supports. The range of services available in the community has greatly expanded since depopulation of institutions began in the 1970s. We have become a major player in providing viable community-based alternatives to institutional care. During the 1980s smaller institutions were closed and larger institutions continued to downsize with the final closure of all institutions by March, 2009. We continue to need the support of the entire community if our Mission Statement is to become an ongoing reality. We seek to support the children, teens and adults with developmental support needs in a way that emphasizes inclusive choice, empowerment and individuality. Inclusion of the people that we support into all aspects of community living is fundamental to the current values that are driving our efforts forward. Please review our most recent financial statements and policies. is the lead agency for Central East Region of the Networks of Specialized Care. To access information about the Networks visit their website. We believe that person-directed planning is foundational to individual success in community living. We listen in order to understand what each individual wants in his/her life. We focus on the development of relationships and help individuals build their future based on dreams, strengths and capabilities. We believe in self-determination, inclusion, citizenship, contribution and participation. We encourage each individual to use their gifts and talents to contribute to life in their community. We provide inspiration, encouragement and opportunity for each individual to achieve new milestones toward a meaningful life in the community. We empower individuals to experience inclusion through educational, vocational, social/leisure, residential and employment opportunities. We create innovative and effective programming, based on evidence and best practices. We are problem-solvers, coordinators, facilitators and navigators, and we have the courage to assist those in need, even in the most challenging situations. We are respectful in all of our interactions and treat all persons with dignity. We value the needs, aspirations and abilities of others, creating a supportive and courteous environment. We believe in full inclusion. We empower each individual to make informed choices for themselves in all aspects of their daily lives, and to live and work to their full potential. We enable individuals with developmental support needs to recognize and use the resources available to them, and to become stronger, more confident and independent. We encourage the involvement of the family in all aspects of the life of the individuals we support. We put what is best for the individuals who need developmental supports and their families as our top priority for decision-making. We use a personal touch, striving to create just the right programs and opportunities for each individual. Our culture is safety-focused, and our employees are meaningfully engaged in safety improvement. We provide a safe environment for learning, working, volunteering, and participating in recreation and leisure activities. We are a highly responsive, caring and dedicated team of staff and volunteers. We are passionate about our work and we interact with empathy and understanding. We demonstrate steadfast commitment to create a better future for every individual needing developmental supports. We remind families touched by disability that they are not alone and that they are part of a vibrant and supportive community. We measure our success and promote continuous improvement, ensuring quality in all aspects of our work. We have high standards for program delivery and focus on best practices in all we do. We are committed to transparent communications with each other and with our partners in order to build trust, to create a positive, environment, and to be unified in achieving our Vision and Mission. We communicate effectively with the individuals we support, providing them with the ability and opportunity to make informed choices. We uphold the trust we have built over our 60-year history, ensuring that we conduct ourselves with honesty, integrity and transparency. We are accountable to our funders and donors. We measure our success, and we operate with cost-effectiveness for all programming. We find strength in a multitude of ideas and perspectives and achieve our goals through effective collaboration. We are united as a group in our purpose and social cause and support each other to achieve collective outcomes. We develop and nurture collaborative, positive relationships with each other and with our partners, and work together to enhance the quality of life of the individuals we support and their families. We believe that individuals should have continuous learning opportunities to fulfill their aspirations, to contribute to society and to create meaning at every stage of their life. We patiently work with each individual and family to creatively solve issues. We allow time for setbacks and keep a positive attitude at all times. We believe in providing individuals with a variety of life experiences that teach the person to accept responsibility. We promote a vision of society that is inclusive and that supports the rights of all persons. We are welcoming and inclusive, and a role model for diversity and accessibility. We demonstrate, through our partnerships and community involvement, that people with developmental support needs are citizens who have contributions to make to society. CLH Developmental Support Services must promote both internally and externally, its mission, beliefs and operating principles. 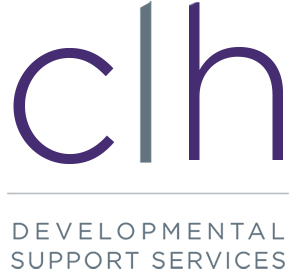 CLH Developmental Support Services shall assist partner community organizations and networks to include and emphasize the positive contributions of the children, teens and adults with developmental support needs. CLH Developmental Support Services strives for quality throughout all aspects of our organization’s work and will measure our success and promote continuous improvement. CLH Developmental Support Services must make the best use of its resources and be fiscally responsible/accountable. The CLH Developmental Support Services Board of Directors is responsible for the governance and accountability of the Association. Among their responsibilities are to establish the agency’s vision, mission, services principles, strategic priorities and overall direction, and to monitor progress as well as compliance with relevant legislation. Directors bring personal skills or knowledge in such areas as finance, law, fundraising, public relations, advocacy, banking, health, or education to CLH Developmental Support Services. Some also bring the knowledge and perspective of a parent or other family member of the people we support. Our Directors help to build an inclusive community that embraces children, youth and adults with developmental support needs and their families. We work with staff, other volunteers, and community partners towards goals that will help improve the quality of life of the people we support. Directors attend Board meetings, which are held monthly (September to June), and an Annual General Meeting. CLH Developmental Support Services is currently looking for Directors. Sound interesting? Please fill out our application form. Doug was born and raised in Ottawa and moved to Midland in 2006 along with his wife Debbie and their two sons, Scott and Matthew. Doug has been in the financial service industry since 1992 and is working with TD Wealth as an Associate Investment Advisor. As part of Thor Wealth Management Group, they manage all of the financial affairs for high net worth individuals in the Georgian Bay area. Over the past nine years of living in ‘cottage country’, Doug has enjoyed coaching Matthew’s minor hockey team and Scott’s Special Olympics bowling league. Ron was born and raised in Toronto attended high school at De La Salle Oaklands, university at St Patrick’s Ottawa and York University Toronto. He obtained his J.D./L.L.B. for Osgoode Hall in 1968 and called to the bar in 1970. Ron practiced until 2004 with a Toronto firm where he was managing partner and in 2004 made Midland/Penetangushene, where he cottaged for many years, his home and joined HGR Graham Partners LLP. Ron has always been involved in community activities and on the board of many charitable and non-profit organizations including being a Rotarian since 1975 in Toronto and now in Midland. His areas of law include real estate, corporate commercial and Ron is also a trademark agent. Dwayne was born and raised in Simcoe County, he graduated from Georgian College from the three year Business Administration course. Shortly after that he went to work with ServiceMaster and worked throughout Simcoe County. In 1997 Dwayne and his wife Tanya purchased ServiceMaster of Midland and moved up to Wyevale. In 2003 they purchased the ServiceMaster of Orillia. Dwayne and Tanya have three wonderful daughters. Dwayne has been a Rotarian in Midland since he moved here in 1997. He is a board member with the Chamber of Commerce and recently finished two terms on the Huronia Community Foundations board. Silvana recently relocated from Cambridge, where she worked as a bank branch manager, to retire in Victoria Harbour, the area where her family has owned a cottage for over 50 years. She has been involved with Community Living Cambridge through her daughter who has cerebral palsy and accessed services from the agency. Silvana served on the CLC board in Cambridge for 6 years and various school councils. Manon Jacques was born in Ville-Marie, Québec, raised in Sudbury, and moved to this area with her family in 1995. Her son now teaches in Borden while her daughter is working on her PhD at l’Université d”Ottawa. Manon received her B.A. and Teachers College Certificate at l’Université Laurentienne. She completed her specialists in teaching the blind and deafblind at Western University. In the past 27 years she has taught both at the elementary and secondary level. Presently, Manon teaches for the Conseil scolaire de district catholique centre-sud. She works as Resource Teacher at École élémentaire catholique Saint-Louis, Penetanguishene and as a teacher for the blind and deafblind at École secibdaure catholique Nouvelle Alliance in Barrie. Born in Saint-Jérôme, Québec, and raised in the Sudbury area, Maryse moved to Penetanguishene after finishing her B.A and Teachers College at Laurentian University in the French program. Maryse married Charles Desroches. She has two step sons, another son and a daughter. Her youngest son was diagnosed with Asperger Syndrome as a teen. The family is learning more and more about the syndrome and the services that are provided in the area. Maryse has been teaching for the Conseil scolaire de district catholique centre-sud (CSDCCS) at École Saint-Louis in Penetanguishene for the past 22 years. She took additional qualification courses to obtain her Special Education degree. She also offered tutoring whenever possible to students in need. Maryse was elected to the CLH Board of Directors in 2012. Janet Weersink was born in Penetanguishene and grew up in Midland. After a brief time away, she moved back to the Midland area where she and her husband of 24 years are raising their 3 sons: Christian, Matthew and Adam. Janet volunteered at her children’s elementary school with fundraisers, breakfast club, lunch baskets, field trips, and sat on parent council for 10+ years. Janet grew up in the retail sales industry as part of the family grocery store business for many years before purchasing Minds Alive Toy Store with her husband. After 5 years, they opened a second location in Collingwood, which was expanded into a larger space five years later. As a member of the Neighbourhood Toy Stores of Canada, Janet was the Catalogue Coordinator for the past two years producing a nationally distributed toy catalogue. Learn about our CLH Foundation Board of Directors. Join our dedicated team of staff and volunteers and help us achieve our mission! Find all contact information for our staff.